The Critical Mom normally gets haircuts only when the oldest child demands that she make an appointment for him, and then she thinks, "Gee, as long as we're there, I might as well . . ." It's nothing like the routine "every six weeks" that she enjoyed long ago. Although she tries, she does try! A few months ago she asked for a graduated bob because her tap group dances in 1920s Charleston-style dresses. A haircut to match, wow! But it grew out fast, as it always does, so one day about three weeks ago (got to remember to make another appointment for three weeks from now) she accompanied her fourteen-year-old to the hairdresser's---the convenient one, the one right by the university, but alas, the one where all the hairdressers smoke and you wish you had a gas mask. They took him first and lo! New management. The guy I'd make the appointment with wasn't there. A longhaired (why do hairdressers always have such awful hairstyles? The cobbler's children have no shoes) guy turned out to be the new hairdresser. He looked me over as I explained the way I wanted him to cut my hair. Another graduated bob, 1920s style. But as I explained, I could tell he wasn't listening. He was gazing at my hair and imagining what he would like to do. Under these circumstances I find I get a better haircut when I let the hairdresser go wild. There was that time I had to restrain myself back when the movie Titanic first came out. I'd seen it once. My hairdresser at that time had seen it four or five times and rapturously asked, "Wasn't it wonderful when she saved him back?" It was on the tip of my tongue to answer that I thought the film the most sentimental piece of dreck I'd ever seen, although I had enjoyed one round. That I couldn't bear the thought of seeing it a second time, let alone four or five times. Before I said any of this I remembered: "This woman has my hair in her hands!" But now, observing the artistic dreaminess in the hairdresser's eyes, I said, "Okay," when he informed me that I had "too much" hair in back, that yes, he could do the graduated bob but he would layer the back . . . . Okay. And he talked. Blah, blah, and blah. He made an interesting remark too, about being Turkish and stuck living in Germany: "You integrate, not assimilate." He was too flirty. So I said as little as possible and let him flirt with my hair, but drew the line when he wanted to color it. I take care of that myself. I like the cut. But as I was heading toward my classroom a few days ago, a younger colleague, male, blanched, asking: "What happened to your hair?" "Oh!" (Look of horror) "Well, it looks good?" said he. All the women in the department like it. The men don't notice. My husband says I always look good. So for whom did I cut my hair? Me. It makes me look younger, you see. 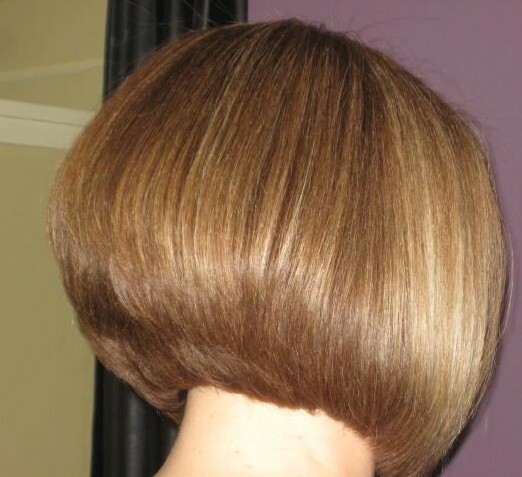 Picture of Graduated bob back view: Back view of Graduated bob hairstyle. Find the latest short hairstyles, long hairstyles, medium hairstyles on our site:hairstylesweekly.com We will update 2013 short haircuts, 2013 long hairstyles and medium hairstyles for 2013. Friends: Oh The Lovely Things!